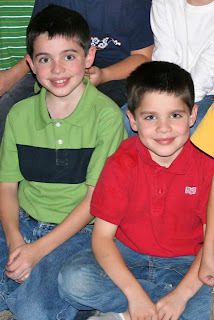 When my boys were younger (ages 6 and 4 1/2) they joined a Blue Knights Club for a couple years which they LOVED and looked forward to each month. However, last year, there wasn't anyone to organize and keep it going. I had my own hands full with my new Little Flowers group and, with Hubby's schedule, it was too much for him to commit to as well, so the boys took a year off. I can't tell you how excited the boys (and I!) were when another mom in our home school group decided to start another group! Last night was their first meeting and they had a great time. They came home with their list of assignments (at nearly 9pm last night) ready to get started right then on completing them before their next meeting, next month. I am so pleased to see their self-motivation, what a difference a couple years (and being able to read!) makes. 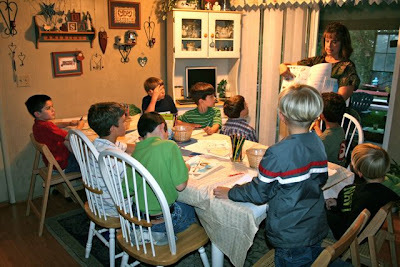 I stayed home with our younger children so that Hubby could attend with the boys. It looks like the boys are going to have a WONDERFUL year! I've often wondered about the Bue Knights and if it will be an option for my son in a year or so. I'm gonna have to jump over to Marci's and check it out. Thanks for sharing this! I cannot tell you how heartbroken my 4 1/2 yr. old boy is that he can't be with his sister and part of the Little Flowers club! My grandmother used to have a Blue Army Juniors club for all the younger grandchildren. I'm sooo glad you posted this!!! A while back, around the time your Little Flowers meetings started, you mentioned to me about Blue Knights. I wasn't sure about it, it looked like something the dads did with the sons, so I wasn't sure about starting one. But I've been praying about it, and now you post this (I LOVE how the Holy Spirit works!). So, maybe I CAN start our own group. Thanks so much for your inspiration and all your ideas that you share with us all. My own boys have been asking about a Club for them since I startedd Orchard House Circle with the girls. I forgot I have had this for years in the bookcase. If you have time and the energy I have tagged you for the 8 Question meme. I'd say at age 5. My boys were 4 1/2 and 6 when they started, and that was about right.